The Texas panhandle breeds a bunch of us long, tall drink-of-water look-alikes. We're as common as tumbleweeds. 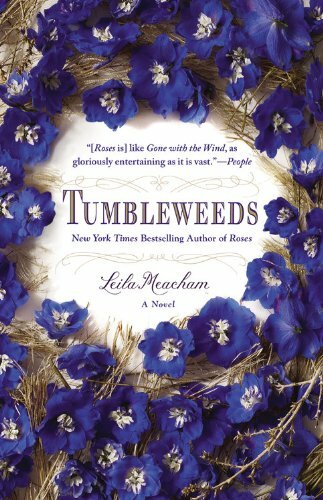 This week I read devoured Tumbleweeds by Leila Meacham. I could not put it down, which was a bad thing because I've had TONS to do this week. Last week I posted about Meacham's other novel, Roses. As much as I loved Roses, I think I liked Tumbleweeds a wee bit better. Tumbleweeds is like a cross between Friday Night Lights and The Thorn Birds. :D This is a very hard review for me to write because I don't want to give away any spoilers, so this one will be short and sweet. I truly want you to read this with as little information as possible. As a matter of fact, don't read the book flap either....just pick up a copy of the book and start reading! Cathy Benson leaves her privileged life in San Francisco to go live with her grandmother in the Texas panhandle town of Kersey when she's eleven after her parents are tragically killed. She is instantly befriended by the sixth grade Big Men On Campus, Trey Don Hall and John Caldwell. Both boys are smiten with Cathy from the first time they lay eyes on her, and they grow up together the best of friends. One of the boys decides he wants to date her their junior year while the other is in love with her, too. A string of unfortunate events ensue during their senior year, and there are many heart-stopping moments in the narrative. There is a lot of football in this book. The Texas panhandle worships the sport, as does Central Alabama. Now y'all know from reading my blog that I love football, but I think that the sport should be kept in perspective. Meacham does a great job in balancing the community's football obsession with what's truly important. What's new on your bookshelf? This is a linky! I am reading A Voice In The Wind by Francine Rivers. It's pretty good. This sounds great! And I am in love with the cover, I am one of those people that alas sometimes does judge a book by it's cover. I am adding this one to my wish list right now. I too had a hard time writing my review this week because I didn't want to give anything away. I stuck with the history instead of the story. Honestly, the cover is so pretty, I think I'd pick it up by that along. I'm adding this to my list. It sounds lovely. I'm reading A Tree Grows in Brooklyn. I should post about it and link up. Found a passage in the book this morning that I loved!! It sounds great! I'm reading one of your suggestions right now: Before Ever After. I'll have to re-read your review after I finish it. Love almost everyone, thanks for all the hard work. Also was waiting to see your new kitchen, glad to know it is coming soon. Sounds interesting Ricki Jill. I wasn't wild about Roses, the cover yes :) That publishing house does a bang up job with the art on the jacket! Free Opportunity to Grow Your Blog! The Good, The Bad, The Ugly, and The Delicious! 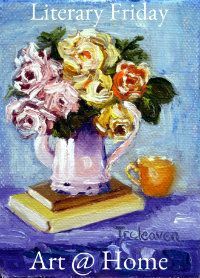 My Happy List: *flowers*, too!